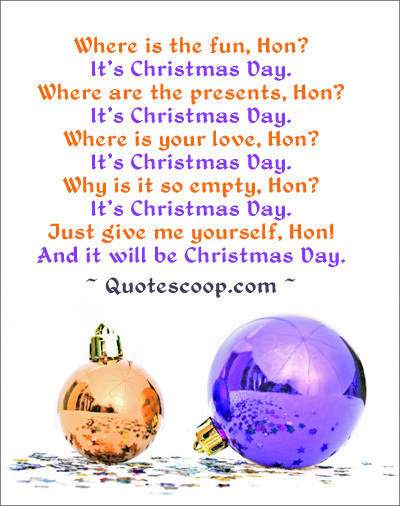 Christmas poems are the spice of the Christmas holiday. And, what's more, they can be enjoyed all year round. Poems lead you down imagination's road to a place of deeper thought, entertainment, and sometimes laughter. 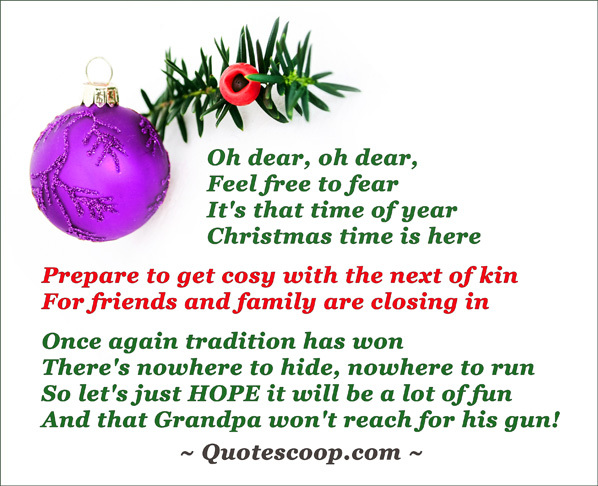 When you read these Christmas lyrics, try to notice or picture what is happening in your mind. After all, you may want to take the journey down imagination's road more than one time. It's a good way to escape the everydayness of life. It relieves the mind of pressure and worry as you leave the world behind and travel down a new and surprising sphere of sight. The following poems about Christmas were written with your pleasure in mind - enjoy! This one supposes that the Christmas tree is somewhat alive and doing a chore. Of course, the tree may be a living tree that was cut down, or an artificial tree, it doesn't matter. The Christmas tree has a job to do - and a tree has to do what a tree has to do, right! You are a good little Christmas tree. Knitting needles for Grandma and for Grandpa some socks. But for Mom and Dad, the bill. This one is only a four liner, but evocative just the same. Christmas is the time for love relationships. If you are not in one when this season arrives, you usually wish you were. There is something about a warm embrace and a close loving relationship at Christmas to make that apple cider seem even more delicious. Topped with a kiss and hug? Christmas is the time to cuddle. Christmas is the time for love. - Where Do They All Go the Rest of the Year? Do you ever wonder what Santa's reindeer and elves do during the year between each Christmas? Of course we know Santa is busy planning next year's Christmas and watching girls and boys to see how 'good' (whatever that means) they are during the year. But what do the reindeer and elves do? When they aren't pulling Santa's sleigh? Do they rest and sleep, or do they party and play? Before they start making Christmas toys? Do they go to toy school or play with elf girls and boys? Being rejected by loved ones hurts any time of year, but it might just be even worse during the Christmas season. This is one of those Christmas love poems that illustrate the feelings of a rejected person at Christmastime. Have you ever had to ask questions like those in this poem? Are you asking them now? Where is the fun, Hon? Where are the presents, Hon? Where is your love, Hon? Why is it so empty, Hon? Just give me yourself, Hon! And it will be Christmas Day. No one is perfect. No one does only what is right and good (again - whatever that means). Most WANT to do what is right and good, but things can get confusing, particularly if your culture happens to condemn something that your heart tells you is right. When your desires and your upbringing (indoctrination) are at odds, what is right and good may be hard to see. At the top of our Christmas tree. She looks constantly down from above. She sees all about you and me. For she sees everything we do. Bad news for me and you. - Where's All the Candy? Have you noticed that there are more treats available during the Christmas holiday? In seems that everywhere you turn there are candy and cookies and everything sweet you can imagine, not mentioning the salty things like pretzels and butter popcorn? Once the holiday is over you may miss all the goodies and suffer severe symptoms of withdrawal. I want to eat it all the year long. Before the next Christmas it's gone. Would you really choose to do it here? If your life right now was a cookie, which kind of cookie would it be? 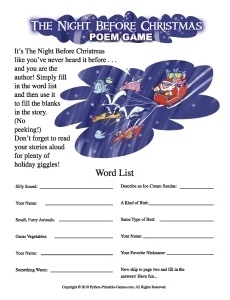 Every Christmas you will probably eat more than one cookie, so what follows next is a Christmas cookie poem. A poem about cookies, yes, that sounds a bit weird, and perhaps it is. But there a so many different kinds of cookies, and there are so many different kinds of life experience. Like the seasons it changes at regular (or maybe irregular) intervals. Some seasons of your life are outwardly 'good' and some are outwardly 'bad'. You will live through both types, and those in between too, and as you live, you experience. What you experience, however, is up to you. You have the choice to always try to find the unique taste - the learning experience - of every life cookie you eat. Even during the spans of time that seems to be void of anything important. If you want, you can make them important. Anyway, in this one the meter is funny. It changes. Though there is no rhyme in the first part, it has a common thread throughout the poem that is a rhyme in itself - it has a meter of meaning. The second, shorter part does rhyme, and the interesting totality makes this either inspirational or funny. When I eat sugar cookies, it reminds me of love. When I eat gingersnap cookies, it reminds me of the biting things of life. When I eat gumdrop cookies, it reminds me of persistence. When I eat gingerbread men, it reminds me of relationships. When I eat butter cookies, it reminds me of the unknown parts of life. When I eat iced cookies, it reminds me of safety. Just relax and have a cookie! As Christmas season approaches some people feel more dread than merriment. Rather than saying 'Ho ho ho' they say 'Oh no no'. If you are about to host the annual Christmas dinner and celebration you may know the feeling. If your family has a fondness for bickering or, worse, big emotional dramas where various members insist you take sides against other family members you SURELY know the feeling. Oh, to be a Zen master! And that Grandpa won't reach for his gun! All good things come to a close, even the Christmas holiday and Christmas Day itself. The last poem is one of the short Christmas poems. It is about the peaceful rest one has after the big day draws tiredly to a close. The excitement ends, and the busy day begins to crawl to its end. You look back over the day and feel relief - and perhaps contentment, too. Hopefully everything in your Christmas happened as planned - or something like it. That's what the tenth and final of the poems about Christmas on this page is about. Contentment. The turkey finished cooking in time for the Christmas meal, the cake didn't fall, and the dinner rolls didn't even get burned! Everybody seemed to enjoy it. This was truly a successful Christmas. Planning and directing the Christmas holiday is a true piece of art, to be treasured in the heart and mind forever. Merry Christmas and good night. The children are finally in bed. It has been a good Christmas, merry and bright. A successful Christmas, well said! These Christmas lyrics can help you get your mind ready for the coming Christmas holiday. If you're right in the middle of it, they can inspire you or make you smile. All these poems may accentuate the things that have happened or will happen this Christmas in such a way that you may see more of what is going on all around you. In any case, the Christmas season only comes once a year. Grab hold of Christmas with both hands enjoy it the best way you know how and don't let it go until you must. Make it last as long as you care - or dare. - An oldie but goodie: the renowned 1911 Edition of the Encyclopedia Britannica's in-depth explanation of Poetry. - The content-free, occasionally very funny encyclopedia Uncyclopedia's definition of Poems / Poetry. - The irreverent, occasionally very funny dictionary Urban Dictionary's surprisingly long (6 separate points) definition of Poem.